Last weekend, Redbank residents and the project team celebrated the slab pouring of the GJ Gardner Variety Freedom House with a community barbeque. 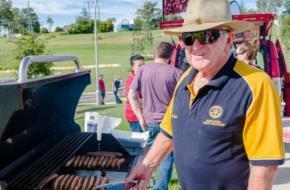 Hosted by Variety, and with the help of the generous Kurrajong North Richmond Rotary Club, the barbeque gave locals the opportunity to get to know one another and see how the Freedom House project was progressing. North Richmond Public School students enjoyed the face painting and giveaways on offer, and Hearty the Variety mascot even made a special appearance. Once built, the Freedom House will be auctioned off to help Australian children who are sick, disadvantaged or have special needs to live, laugh and learn. 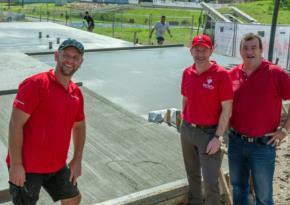 Project partners broke ground on the site last month with the help of NRL legend Mark Geyer. A generous team of tradies and suppliers will be working hard to build the house by August, ready for auction in spring. Yeoman’s soon-to-be residents, Timothy Rapson and Beth Crawford. 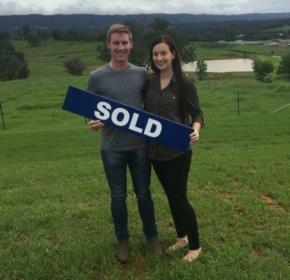 First home buyers Timothy Rapson and Beth Crawford are the proud new owners of a slice of the Redbank lifestyle at Stage 4 Yeomans. Currently living in Rouse Hill, the engaged couple are looking forward to their independence when they move out from their parents’ homes for the first time and start their life together. Timothy and Beth chose to buy at Redbank for the location, beautiful scenery, environmental focus, and overall community feel. 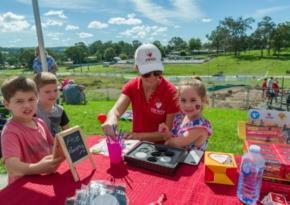 They’re keen to get to know their new neighbours and experience what the Hawkesbury region has to offer, including the local golf courses and the Sydney Polo Club. With construction to commence on their new home and a wedding to plan for next year, Timothy and Beth are excited for what’s to come. We welcome Timothy and Beth to the Redbank family. North Richmond Public School students celebrate the slab pouring of the slab pouring of the GJ Gardner Variety Freedom House at Redbank. Did you know one of Australia’s oldest pub is just up the road in Windsor? During the time of Napoleon’s reign in 1815, The Macquarie Arms Hotel was built as a public reception house under the order of Governor Macquarie himself. More than 200 years on, it’s believed the spirits of the first residents and punters can still be seen and felt lurking in the cellar and main bedrooms of the hotel. If you are feeling brave, or in the spirit, book a ghost tour. 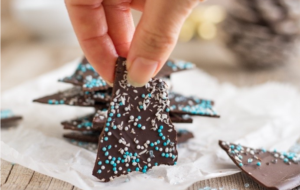 With school holidays in full swing and Easter only a few days away, it’s time to hop to it and keep the kids occupied in the kitchen with some of these cracking chocolatey recipes. 1. Line a baking tray with baking paper. Break the dark or milk chocolate into a large glass bowl and place over a small saucepan of simmering water, ensuring the bowl doesn’t touch the water. Over a low heat, slowly melt the chocolate, stirring occasionally until smooth and glossy. 2. Pour the chocolate onto the prepared baking tray and spread into an even layer using a spatula. 3. Top the chocolate with the assortment of Easter treats. 4. Leave to set at room temperature, then break into shards to serve. Chocolate will keep for two weeks in an airtight container. 1. Preheat oven to 180 degrees and line 12 cupcake cake tins. 2. Mix the cake according to packet instructions, spoon the batter into the cupcake liners and bake for 15-18 minutes. Cool to room temperature. 3. For the icing, melt the white chocolate chips in the microwave and leave to cool. 4. In another mixing bowl, beat the cream cheese and butter for one minute. Then add the melted chocolate and vanilla extract and beat for another minute. Beat in the sugar until your mix is light and fluffy. Add milk to achieve the desired consistency. 5. Transfer the icing mixture to a piping bag and pipe onto the cupcakes. 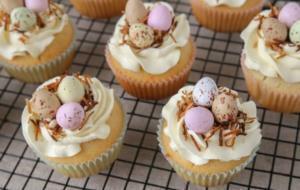 Top each cupcake with toasted coconut and three mini Easter eggs. Adapted from a Mom Junction recipe. Redbank invites you and your family to the prestigious Sydney Polo Club at Richmond for an informal get together. Take in the beautiful surroundings and connect with your new neighbours while you catch up on the progress of Redbank Estate. Held over the weekend before Anzac Day, the St Albans Folk Festival is home to quality traditional and contemporary folk music, as well as workshops, dances, poetry and children’s activities. The event showcases a long list of local and international performers, song writers and musicians, as well as a range of food, produce and market stalls. Do you ever think about what life was like in the Hawkesbury 150 years ago? The Australiana Pioneer Village will transport you back to the time of horse-drawn carriages and blacksmiths, and allow you experience the sights, sounds and aromas of the past. Located just outside of Windsor on the banks of the Hawkesbury River, The Australiana Pioneer Village offers visitors a range of attractions for the whole family, from miniature train rides and shearing demonstrations, to ghost tours and horse carriage rides. Sunday, 23 April at 8am Meet at the dam end of Peel Park What to bring: water, sunscreen, binoculars and camera. Kids Build Together provides a unique space where you and your children (ages 0-7) can learn, create, interact and develop using a range of different building blocks. The program helps to develop skills such as literacy, maths, physics and social-emotional skills. There’s no need to book, just drop-in and play. The latest exhibition to hit the Hawkesbury Regional Gallery is Soft Core, an exploration of the many facets of ‘softness’. From large-scale inflatables and forms made from soft materials, to materials that simply look soft, the featured artists are showcasing works that demand attention. Using air, nylon, unfired clay and plastic bags, some of the works even require activation using electricity or inflation. Take the kids down to the Hawkesbury Central Library to grab a bargain. A range of new and second-hand books will be on sale for budding bookworms. 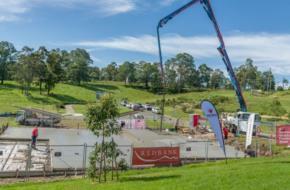 Excavation works on the GJ Gardner Variety Freedom House have been completed and the slab has been poured. To celebrate, Variety hosted a community barbeque with face painting, giveaways and an appearance from Hearty the mascot. From 11 April, the site is now closed as construction works begin. McDonald Jones application for Home Owners Warranty (HOW) has been lodged and will be provided to all homeowners shortly. If you are in the process of obtaining the ‘Authority to Commence Construction’ letter from your bank it may be useful when received to send the HOW to the lender. For any questions relating to this or your building contract, please contact Elif Kaplan via email at ekaplan@mjhmulti.com.au or on 02 8808 7467. As advised, Stage 2 has been lodged with LPI. Registration is expected to take three to five weeks. Our solicitors, Thomson Geer, will contact your legal representatives to notify them of registration. Our meeting was held with Sydney Water (SW) on 13 April and a preferred option was selected. The preferred option now goes through SW Approval, Concept Design, Detailed Design, Delivery, and Commissioning. We are working with SW on a program timeline and will update further as plans progress. Clients who have not yet provided their paperwork, please contact the sales office this week to finalise. We have limited remaining land so please hurry if you don’t want to miss out. Civil works are still on track to commence by midyear. No new updates. Civil construction is still on track to commence midyear. We will continue to keep purchasers updated during this hold period. Details for our planned site inspections for buyers will be released when construction commences.